For 50 years there has been an international moratorium on whaling. 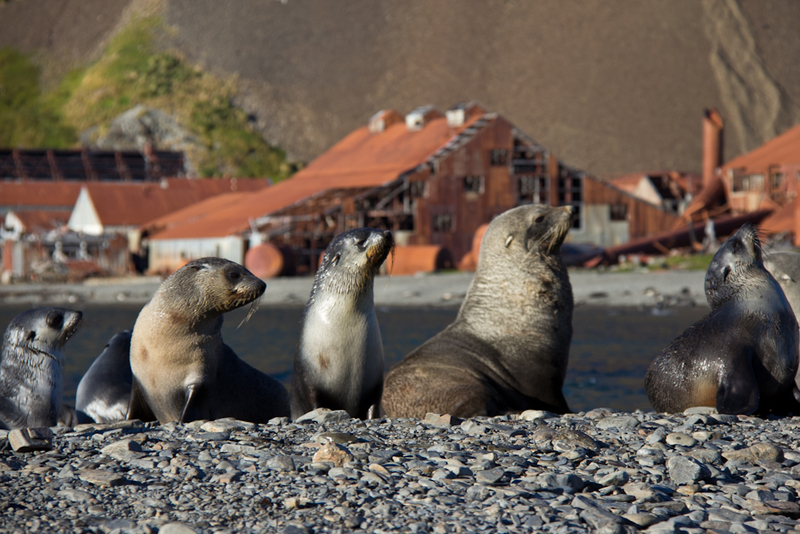 Two years ago, in South Georgia Island in the subantarctic I saw the remains of the Stromness whaling station — where Ernest Shackleton famously first reentered civilization and found rescue for his crew after his ship was lost in the Antarctic. 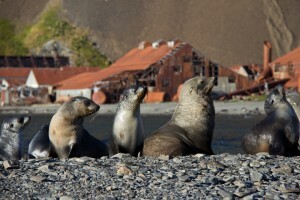 Today, Antarctic fur seal pups frolic among the wreckage. What you can’t see are the immense mountains of whale bones still lying at the bottom of the inlets and bays around South Georgia. It’s a terrible legacy that we should be happy about leaving behind. But today it’s a surprise to many that we still haven’t “saved the whales.” Today’s challenges, like ship strikes, entanglement with fishing gear, noise, and climate change are increasingly complex issues to solve, made more complex because of the way that we manage our oceans. Even though the salt water portion of the United States is actually 20% larger than our land mass, we have no “Department of the Oceans.” More than two dozen agencies, including NOAA, the U.S. Coast Guard, Interior, EPA among others, must navigate a confusing array of laws, regulations and responsibilities in order to solve problems. Last week, the White House issued its final plan for managing the nation’s oceans, the National Ocean Policy, outlining a strategy that strives to coordinate the work of these agencies and help reconcile the many different — and sometimes competing — interests, such as recreation, fishing, and oil drilling. It may sound a bit dry, boring, and bureaucratic, but it is exactly the kind of medicine our oceans need. I’ve become convinced by seeing a growing number of examples of how the National Ocean Policy can work by making it easier for federal agencies, state and local governments, NGOs and private industry to get around the table and work out solutions. One of the best examples of how this can work is in Stellwagen Bank National Marine Sanctuary, a rich stretch of ocean at the mouth of Massachusetts Bay, home to several species of endangered whales including humpback whales and North Atlantic right whales. There are only an estimated 400 right whales remaining in the world. The shipping lanes of Boston Harbor traverse through directly the Stellwagen Bank National Marine Sanctuary, drawing large ships through whale feeding grounds, resulting in collisions with whales that are often fatal. Using the latest research on the great whale’s travels and analyzing their sounds and songs, marine biologists, together with shipping executives, marine biologists, NOAA, the Port of Boston and an energy company came together and found a solution that worked for both commerce and whales. In 2007 the Port of Boston became the first port in the nation to move the shipping lanes to protect whales, reducing the risk of ship strikes to endangered right whales and other whales by more than 80 percent. Whales along the California coast, including blue whales, face ongoing collisions from passing ships. (See Great Whales Face Grave Threats.) If we can fix the problem in New England, we can do it in California. It’s critical and it’s clearly doable. 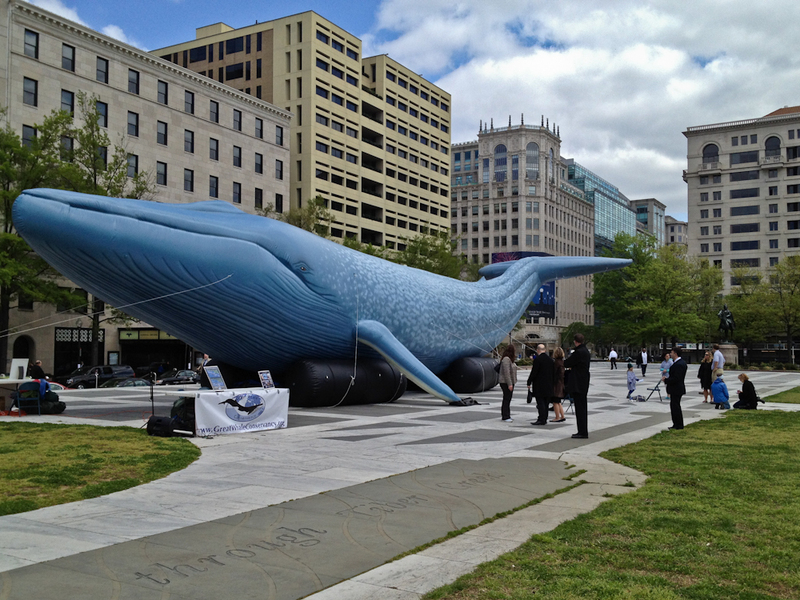 Today, the Great Whale Conservancy celebrated Earth Day 2013 by bringing a life-sized 90-foot inflatable blue whale to Washington, DC’s Freedom Plaza on Pennsylvania Avenue, in eyeshot of the Capitol dome to spread the message about the situation in California and the need for the Administration to take action. Her presence was a delight for hundreds who dropped by, snapped photos, and marveled at the sheer size of the largest animal ever to inhabit the earth. On Earth Day our focus is on this wondrous planet and the rich and diverse plants and animals that inhabit its lands, waters and skies. But Earth Day is also every bit as much about our own species. Because in the end, how we treat our fellow non-human inhabitants — including the majestic great whales of the world — may be the best measure of our own humanity.